GIBSONTON — At East Bay Raceway it was Dustin Cates winning both the Mini Sprints and Micro Sprints features tonight. Ronnie Heard won the Q Auto & Injury Attorneys Street Stocks, Phillip Cobb won the Limited Late Models, Greg Pae won the Outlaw Fours, Jeremy Simpson won the V8 Warriors, Mavrick Varnadore in the Gagel’s Open Wheel Modifieds, Robert Kissam in the Motorstats.com 4 Cylinder Bombers and Devin Dixon in the Late Models. In the 15-lap Micro Sprints feature it was Dustin Cates picking up another win with Cliff Evans second and Matt Wedgewood third. In the Q Auto & Injury Attorneys 15-lap feature it was Ronnie Heard picking up his first win of the year over second place David Riner and third place Allen Bailey. In the Limited Late Model 15-lap feature it was Phillip Cobb grabbing his third feature win of the season with Roger Crouse second and Jesse Brown third. In the Outlaw Fours 15-lap feature it was Greg Pae winning his third feature in a row over second place Raymond Rogers, Jr. and third place Cecil Martin. In the 15-lap V8 Warrior feature it was Jeremy Simpson picking up the win with Raymond Vann second and Bill Whitney third. In the Gagel’s Open Wheel Modified 20-lap feature it was Mavrick Varnadore picking up his third win of the season with his brother Travis a close second with Austin Sanders third. In the Motorstats.com 4 Cylinder Bomber 15-lap feature it was Robert Kissam picking up the win with Kayla Jones second and his brother Wayne coming home third. It was Devin Dixon picking up the win in the 30-lap Late Model feature over Jack Nosbisch, Jr. finishing second and Phillip Cobb third. In the Mini Sprints 15-lap feature it was Dustin Cates picking up his second win of the night over Don Quinn and Richie Statzer. Action continues next week with the Eagle Jet Top Gun Sprints, Limited Late Models, Florida Old Time Modifieds, Q Auto & Injury Attorneys Street Stocks and the Micro Sprints. 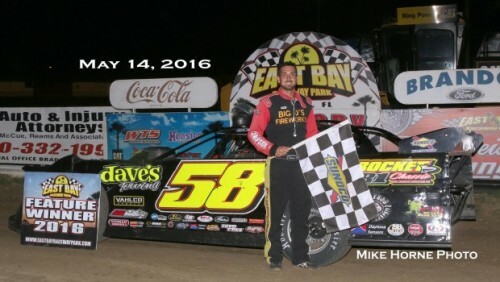 For information, visit eastbayracewaypark.com or call 813-677-7223. 2. 40R Raymond Rogers, Jr.
5. 88 David Pollen, Jr.
2. 11j Jack Nosbisch, Jr.
7. 95 Steve Mathis, Jr.